Online registration for many bicycle events is available at active.com. These publications and others are available at many bike shops and at the runners' restroom just south of the Visitor Information Center on East Mission Bay Drive near the Clairemont Drive exit from Interstate 5. Each of the following outfits conducts several organized rides per year in and near San Diego County. Check their websites for more information. San Diego County has bicycle events all year round. In most cases, more information is available a few months before each event. The names may vary slightly from year to year. Solvang Century, Metric and Half Century, March 9, 2019, Solvang. www.bikescor.com. Simi Valley Cycling Festival, April 6, 2019, Simi Valley. www.bikeride.com/events/simi-valley-cycling-festival. Sea Otter Classic, April 11-14, 2019, Monterey. www.seaotterclassic.com. Tour de OC, April 27, 2019, Costa Mesa. www.tourdeoc.org. Wildflower Century, April 27, 2019, Creston. slobc.org/wildflower/index.html. Finish the Ride, May 19, 2019, Griffith Park, Los Angeles. www.finishtheride.org. Amgen Tour of California, May 12-18, 2019, Sacramento. amgentourofcalifornia.com. Paso Robles Cycling Festival (formerly Great Western Bicycle Rally), May 24-27, 2019, Paso Robles. www.greatwesternbicyclerally.com. Los Angeles River Ride, June 9, 2019, Los Angeles & Long Beach. la-bike.org/bike_ride/river-ride. Giro Bello, June 22, 2019, Sebastopol. www.girobello.com. California Coast Classic Bicycle Tour, September 21 - September 28, 2019, San Francisco to Los Angeles. www.californiacoastclassic.org. Patriot Ride For Our Heroes, October 19, 2019, Palm Desert. www.tourdepalmsprings.com. Tour de Palm Springs, February 7-8, 2020, Palm Springs. www.tourdepalmsprings.com. A delightful 25-mile, two-and-a-half-hour ride with no significant hills. Most of it runs along bike lanes or separated bike paths. The scenery is rich and varied. An easy 14-mile ride around beautiful Mission Bay in San Diego, mostly along separated bike paths. Great views of the bay and the Pacific Ocean. A 37-mile scenic loop through the mountains east of San Diego. A 20-mile scenic loop around Peñasquitos Canyon and along Highway 56 through McGonigle Canyon. A fairly easy 10-mile ride from Mission Bay to Cabrillo Monument in San Diego. The hills are gentle and the views are terrific. My first century ride. A 100-mile ride from Downtown San Diego to Escondido and Oceanside along inland routes and back to San Diego along the coast. Very few hills. Nearby bus and Coaster lines for support if necessary. Logistical support in business districts. The most do-able century in the county. A scenic and challenging ride around the mountain community of Julian, California. An 8-mile ride around the Santa Luz district of San Diego, mostly in the Santa Luz Open Space Preserve. Good views, interpretive signs and plaques for local fauna and other points of interest. A 12-mile ride around Poway, mostly on unpaved riding and hiking trails. Good views. A 20-mile ride through Pamo Valley and Black Canyon north of Ramona. Magnificent views. About half of the ride runs along unpaved roads. You can also drive most of this route, but a four-wheel-drive vehicle is recommended for the roughest part. Florida Canyon contains approximately five miles of mountain bike and hiking trails, of varying difficulty. It is close to downtown San Diego. 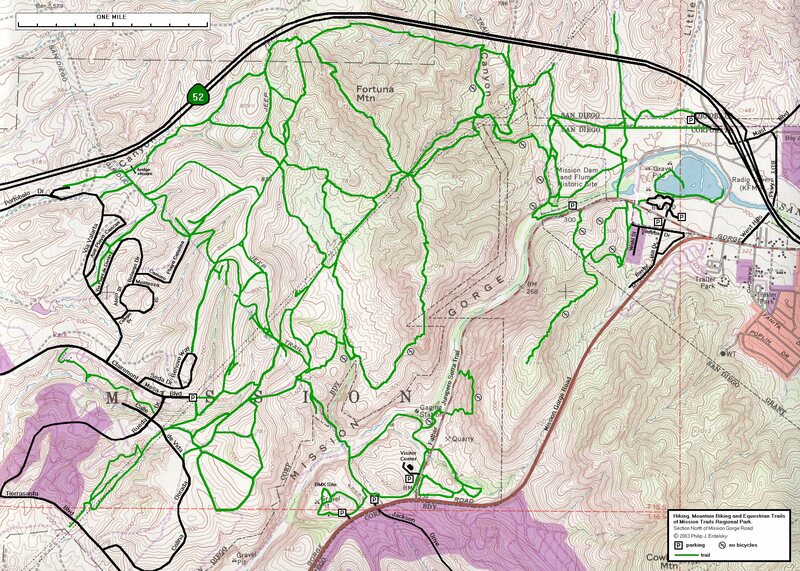 A map of the trails in part of Mission Trails Regional Park, drawn to scale and superimposed over a topographic map. Updated from time to time as trails are surveyed. Bicycles are allowed on most trails. A popular mostly off-road 12-mile loop in Fullerton, California. Descriptions and maps for other off-road bike rides in Southern California may be found at www.socalmtb.com.